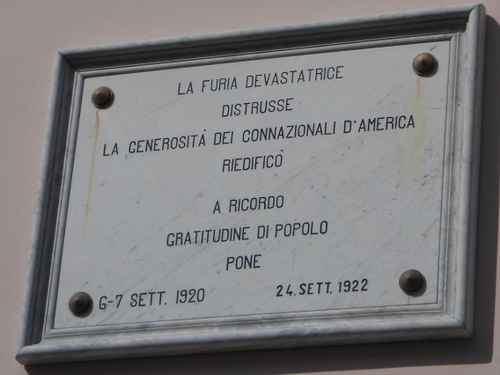 On September 7, 1920, at 7:55 a.m. Garfagnana was shaken by a massive earthquake whose epicentre was located at Villa Collemandina. Its magnitude was 6.6 on the Richter scale and it originated at 4 kilometres below the surface. I was reminded of these unsettling facts since we’ve already experienced two slight earth tremors in the past month, graded around three plus on the Richter scale. Last week I found myself passing near Villa Collemandina and decided to give the place a closer look. I’d visited it once before when we sang in the church and was amazed then at how well it had withstood the earthquake. However, here are archive pictures of the church showing the damage it sustained in I920. Here is the church as I saw it last week. It doesn’t seem as if an earthquake had ever hit it. Notice, however, that the vaulting was not replaced, exposing the original wooden beams above it. The church, which is dedicated to Saint Sisto, has some wonderful features including a fine altar painting and a marble tabernacle. 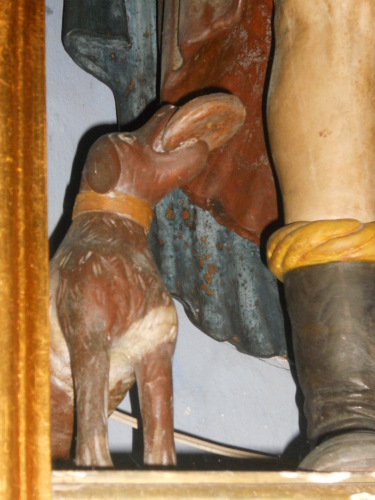 Saint Rocco’s dog, who brought the saint stinking from a plague sore his breakfast bun when humans refused to approach him, is sweetly depicted. The terrace in front of the church gives out onto a spectacularly extensive view of the Apuan mountains. Don’t miss this magnificent cloister just to the left of the church (as I did the first time I was here). The column capitals are superb and form a backcloth to many a Garfagnana wedding picture. Again it’s a miracle that this wonderful piece of Romanesque architecture has survived. The town itself was rebuilt with houses of not more than two stories and with wide streets. It looks very much like an I920’s model estate village which, of course, it is. If San Francisco is due for the “big one” then pessimists here also feel that “big one” will hit us as it normally does every hundred years. Less than seven years to go then? Hope not…..
One of the nice things about singing in a choir is that, apart from socialising with affable people, one gets the chance to travel around. Most of this travel is in the Garfagnana and Lucchesia but yesterday we got the opportunity to travel to Suvereto in the south-west part of Tuscany. The weather was absolutely perfect with a high pressure area and true-blue sky. Our road went tantalisingly near the coast before turning into the hill town of Suvereto. Many of us felt like hijacking the coach and taking to the beach instead of singing in a church. However, the town turned out to be an absolutely delightful place. 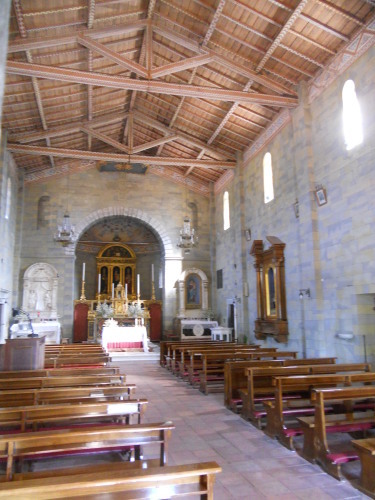 First, we stopped at the parish church of San Giusto just outside the main gate. The church is an atmospheric Romanesque building dating from the eleventh century with some marvellous features. The acoustics lent themselves excellently to our singing. As we were early we decided to take a look at the old town which turned out to be most scenic. The town hall was a solemn arcaded building. This church celebrates a miracle in which the Virgin saved the town from being flooded. In view of the summer we’ve had perhaps she could be invoked more frequently. The cloister belonging to the ex-convent of Saint Francis was most picturesque and is not just used for hanging out one’s washing but also to present a lively festival of events in the summer. We could have gone on to visit the castle at the top of town and even the doll’s museum but duty called and we returned to San Giusto. I think we sang really well. Our choirmaster seemed pleased with us and certainly the congregation was. After the event we were each presented with a lovely book on the churches of Suvereto and we took some photographs at the top of the church stairs. 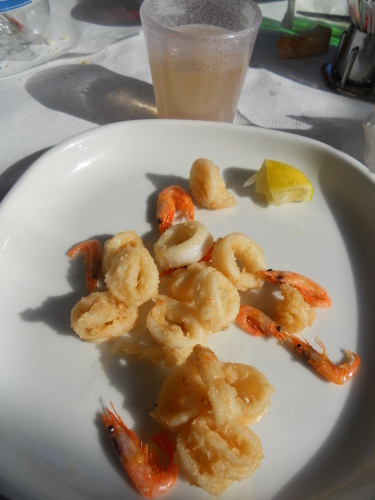 Then after a slight wait for the coach to return (actually it wasn’t the same coach since the one that took us to Suvereto had sprung a leak) we headed for our restaurant meal. Our initial reaction at seeing the appearance of the restaurant was less than favourable. It seemed a somewhat unappealing place. But, as they say in Italy, “L’abito non fa il Monaco” (or in English, “don’t judge a book by its cover”) and the meal presented to our party of thirty-plus was gargantuanly fabulous. we had two pasta courses: farfalle with prawn followed by pappardelle with wild boar. We got a choice of veal or more wild boars for the main course. 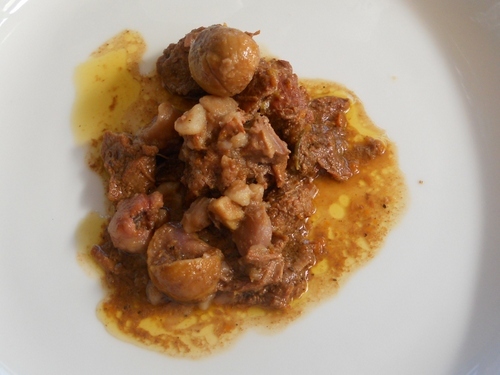 I chose the boar, served with chestnuts, which is famous in this part of the world and found myself munching through the best example of it I’ve ever eaten. 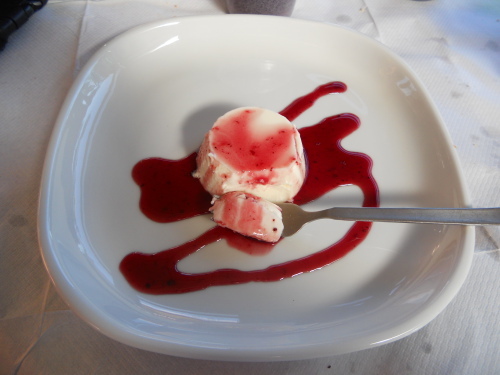 We managed the dessert, which was fruits of the forest and panna cotta, an Italian dessert made by simmering together cream, milk and sugar, and ended with coffee and a final tipple of spumante. After the meal we were homeward bound. The journey back seemed much shorter than the journey to Suvereto and we enjoyed our camaraderie enormously. I got home just after seven to be greeted by a reception committee of three hungry cats and realised I’d forgotten to take a doggy (or catty?) bag with me. Toyland came to Bagni di Lucca yesterday. 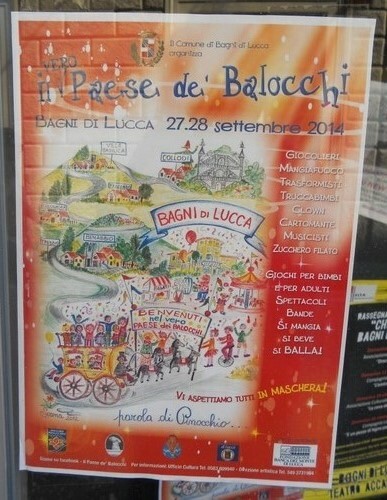 That’s what “Il paese dei Balocchi” means. Fortunately no one found they were growing long furry ears or otherwise turning into a donkey. (Ever read Pinocchio?). We were entertained by street artists and a thumpingly good band appropriately called “Bim-Boom-Bam” consisted of saxophones and percussion. Tight-rope walkers, soap-bubble experts, fortune tellers, a geni from a lamp, old wooden games and a panoply of stalls completed the picture on a veritably sunny day. The festivities continue today (Sunday) in case you missed out on yesterday. But why may you ask has Bagni di Lucca become Toyland (or “fun and games” land, if you prefer?). It’s because it’s reckoned that Carlo Collodi when he was writing the chapters on the paese dei balocchi in Italy’s most read book had his thoughts on Bagni di Lucca on the other side of the pass from Collodi town since Bagni di Lucca was then the gaming capital of Europe and also a major entertainment centre. It’s good to make up for faded past glories in this way. Clearly, Bagni di Lucca will never regain the paramount position it had in the nineteenth and early twentieth centuries but it can still lay on days to amuse both children and adults. Well done to all those of you made this event possible. We need this kind of thing desperately today. 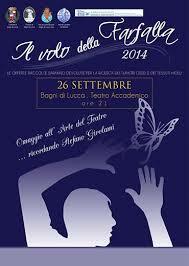 “Il Volo della farfalla” (The Butterfly’s flight) returned again this year to Bagni di Lucca’s Teatro Accademico. The event was organized to commemorate a young and highly promising actor from Bagni di Lucca, Stefano Girolami, who died, aged only 28, on September 24, 2010, after becoming a victim to Ewing’s sarcoma. Ewing’s sarcoma is a malignant tumour: a rare disease in which cancer cells are found in the bone or in soft tissue such as the pelvis, the femur, the humerus, the ribs and collar bone. This terrible condition particularly attacks young people, mostly males. The evening consisted of a variety show called “Piano-B” written and directed by Laura Caressa and Giulia Olivari with choreography by Costanza Mucci, Frederica Zei and Maddalena Borelli. The scene was a bar without a barman. Someone to fill the post needed to be found urgently. Three characters applied. One appeared to be a Russian magnate but turned out to be a person from Bari. There was a guitar strumming couple who also wanted to be considered and a tenor who was, in fact, our local – and now international – celebrity Claudio Sassetti. Three companies were involved: the “Seifior”, friends of Stefano, who always join up every year for the “Volo”, the “sognattori” (Dreamers) an amateur dramatics society from Altopascio and the Daedalus dance academy. In addition, there were guest appearances from Michela Innocenti of the Teatro Colombo of Valdottavo and Boris Moschetti. What I particularly enjoyed was Claudio’s appearance. He has certainly graduated from being just another good Italian tenor to becoming an all-round show-person with good presenting and acting abilities. In an age where love of lucre and “I’m all right Jack” attitudes seem to proliferate ever more viciously it is very heartening to see friendship and solidarity producing a show in which all the participants gave of their talents without fee (even paying their travel expenses, often from some considerable distances). The theatre was almost full – I should have liked those few empty seats to be filled too –perhaps next year? Meanwhile I’m sure that the offerings box for this free event will have produced a generous sum to be used to further research at Bologna’s Rizzoli institute whose director was present at the evening and who gave an interesting account of how the chances of alleviating the symptoms of Ewing’s syndrome have been much improved in the past few years. Each one of my blog posts gets feline approval though I think the main reason for my cats congregating around the laptop is that they like to bask in the heat generated from it. Recently, I had a problem with pressing the “a” key only to discover when dismantling part of my keyboard that there was an accumulation of cat hairs under it: that’s because they also like to sit on the keyboard when I’m not looking. The newest rescue cat arrival, Cheeky caught her first mouse yesterday. Anyone with cats round has to be prepared to put up with these gory sights. At least it shows that I have no non-working cats around.. 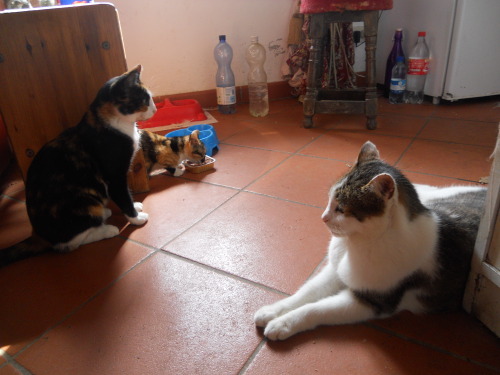 The other two cats, Carlotta and Napoleone, after some initial hisses, also appear to be “motherly” to Cheeky. Note how they are waiting for their turn to feed. Even cats can be compassionate. Florence seems emptier this summer/autumn. It also is a lot pleasanter to walk around in since the heat has not been allowed to build up because of the many days of rain we’ve had – thirty five in july/august to be exact! On our way to Fiesole we passed Poggio Gherardo. Unless the name Janet Ross means anything to you, Poggio Gherardo will just be another large fortified villa on the northern slopes of the Florentine hills. Janet was described as frigid sexually, denying her husband (who was thirty years older than her) his marital privileges. She was always in the right about everything even though she might, in fact, be wrong. She left her estate at Poggio Gherardo to Lina in a parlous state. Lina made a valiant effort to keep it going but eventually had to sell it after WWII. Even Ross’s books are often carelessly written (apart from her cookery ones. See http://www.amazon.co.uk/Leaves-Our-Tuscan-Kitchen-Vegetables/dp/1164865420). On the plus side “Aunt Janet”, as she was known to all who met her, could be generous and hospitable. 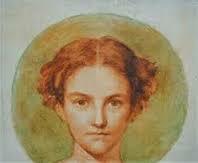 Among her protégés were Addington Symonds and the young Kenneth “civilization” Clark, for example. Her life style was liberated for her times and she was a good horsewoman (and cyclist too) at a time when it was still difficult for a woman to assert herself. She would amuse her guests by singing often bawdy “stornelli” (popular folk songs) on the guitar. I don’t know if there still exists an anglo-italian community in Florence anywhere reminiscent of the one that flourished before WWII. Zeffirelli’s film, “Tea with Mussolini”, is a brilliant evocation of the last days of that community, experienced first-hand by the film’s director since he was adopted by no less formidable successors to Mrs Ross. I would need to spend more time in this city to find out but I’m sure there are lingerings of it somewhere in the city of the lily. With the death yesterday of Christopher Hogwood one of the greatest of early music scholars, conductors and performers has left us. It is quite clear that without the pioneering work of people like Christopher a series of concerts such as Florence’s “Festival of ancient Music” would hardly have been possible today. The series of concerts with the title “Dagli albori Del Barocco al Classicismo” (from the dawn of the baroque to classicism) started on September 19th in the Sala capitolare of the basilica of Santo Spirito in Florence. All concerts start at 9 pm. If you didn’t know Santo Spirito church in Florence then here’s your chance to visit one of the most exquisite renaissance creations. 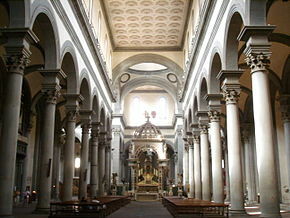 Designed by Brunelleschi, it is the church closest to the ideal canons of quattrocento architecture as laid down by Alberti. 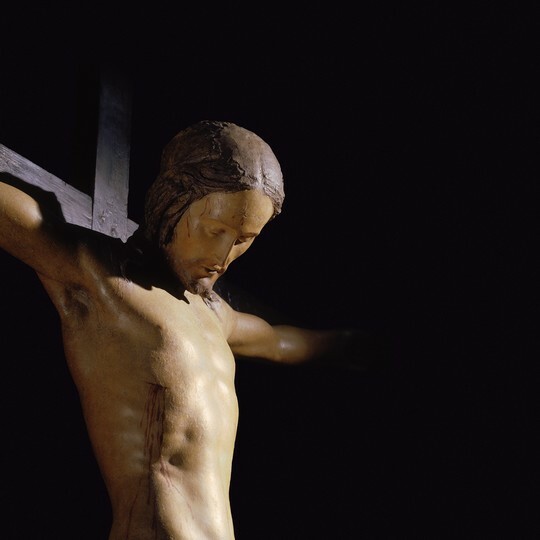 Santo Spirito is also a gallery of some of the finest rinascimento art, including the crucifix sculpted by a youthful Michelangelo. 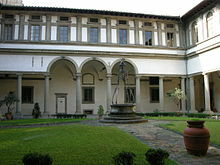 You also get the chance to see the Ammannati great cloister which is normally closed to the public. It’s, of course, possible to make one’s own way to Florence and make a week-end of it since all concerts are on a Friday. But you can also contact “Grapevine” (who is a sponsor of the event) at normajeanbishop@gmail.com as transport can be laid on provided a sufficient number of persons from the Bagni di Lucca area show a deserved interest in the festival. 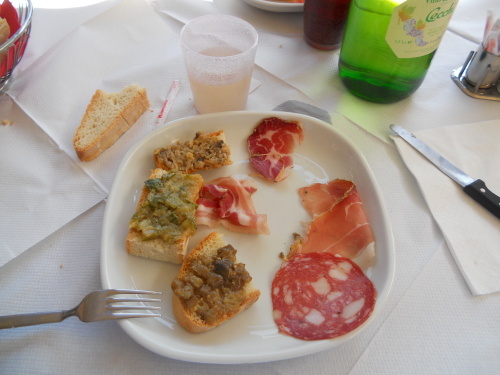 Do Nothing or Do Everything in Italy….